Bath & Body Works has a trio of scents available that are sure to lift your spirits during the cold and dreary Winter months! From the colorful graphics to the luscious scents, these products give me hope that Summer is not as far off as it seems. You can read more about the scents, notes, and pricing below my mini review of the Bali Mango Body Lotion. The Bali Mango Body Lotion has a deliciously sweet citrus scent that isn't too sweet, once it dries down. At first, this smelled more like bubble gum, which wasn't too appealing to me. Luckily, once I applied it, the true scent was delightful. It smells very natural to me, like a slightly tart mango with a hint of sugar. The fresh fruity scent definitely makes me think "tropical" and "summer", and those thoughts are inspiring to me in the dead of winter. 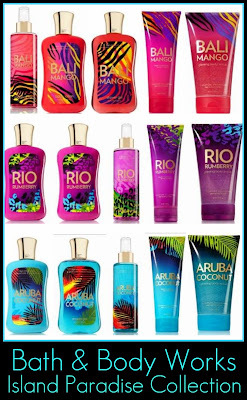 Although the weather is chilly, get in the tropical state of mind with Bath & Body Works Island Paradise Signature Collection featuring Aruba Coconut, Rio Rumberry and Bali Mango. *Product featured was furnished by the manufacturer or PR firm for consideration. I love these, they always come up with great scents. I'm sick of cold weather. I'd love something tropical right now. These sounds like they'd smell delightful! I'm glad this scent made a come back! The Bali mango is absolute heaven !! Bali Mango is THE best:) &it really brings my spirits up surprisingly..